Tight deadlines are great motivators, a central premise of National Novel Writing Month. November 1 to November 30, from first sentence to last — 50,000 words minimum — get it done. 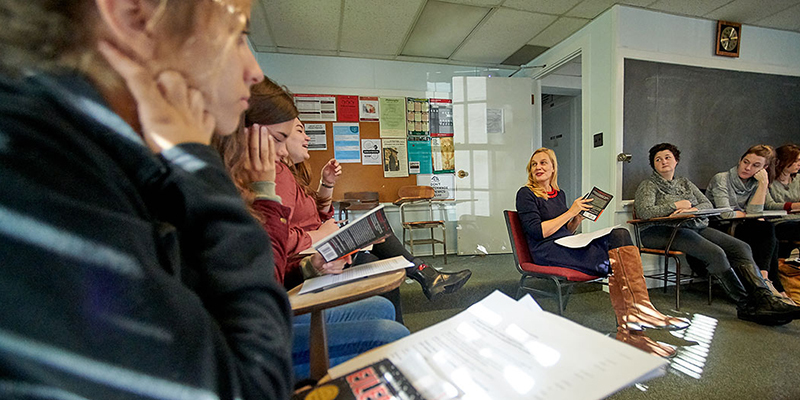 While that ambitious endeavor requires many solitary hours, UVM students in Maria Hummel’s section of English 114 have a seasoned novelist to help ease the way. A Class of 1994 alumna who returned to the university two years ago as an assistant professor of English, Hummel is a three-time novelist and accomplished poet. Her latest book, "Still Lives," was published this summer. Though it is Hummel’s first foray into mystery, the novel has squarely found its mark with readers. Her publisher, Counterpoint, made it their lead title in June, and it was selected by both the Book of the Month Club and Reese Witherspoon's Book Club. Publication rights have sold for the United Kingdom, Australia, and New Zealand markets, and film and television producers are interested in screen rights. Several years ago, ripe for a new path, Hummel decided to venture into mystery. Her previous two novels—"Motherland" and "Wilderness Run"—were works of historical fiction. The particular challenges of writing a mystery, which she viewed as a kind of formal exercise in unknown territory, beckoned. “Mystery is one of the most codified forms that we have in fiction, though writers bend that form all the time,” says Hummel. Another new frontier: rooting her fiction in places, people and circumstances of her own life. For several years between graduate school in North Carolina and a Stegner Fellowship and teaching at Stanford University, Hummel worked as a writer/editor at the Museum of Contemporary Art in Los Angeles. That immersion in the L.A. art world seemed to offer a rich vein for fiction, and she made some initial efforts during her Southern California years, but nothing jelled: “I was too close to the material then.” But a decade later, setting a story amidst the excess and intrigue of that milieu clicked. As her English 114 (“NaNoWriMo”) students have prepared for the November novel challenge all semester, Hummel shares her own process via class discussions, exercises, and one-on-one conferences. Students first write character sketches, much as Hummel did when beginning to find her way on "Still Lives." Considering structure, she references screenwriter/director Stanley Kubrick’s dictum that every film requires seven “non-submersible units,” key moments that evoke the pattern of change or emotional development at the core of the plot. She has the students chart out what their seven unsinkable novel scenes would be. While beginning to draft "Still Lives," Hummel did a deep dive into Ian McEwan’s "Atonement," carefully breaking down how he unfolds his story in the first sections of the book. This semester, her students have done the same with a favorite book, sharing their findings in class presentations.